For the following examples I’ll be connecting Arthas to a running Spring Boot application take from my tutorial “Integrating Swagger into a Spring Boot RESTful Webservice with Springfox”. Error: no available java process to attach. [-b]            : batch mode, which will disable interactive process selection. [-f]            : specify the path to batch script file. 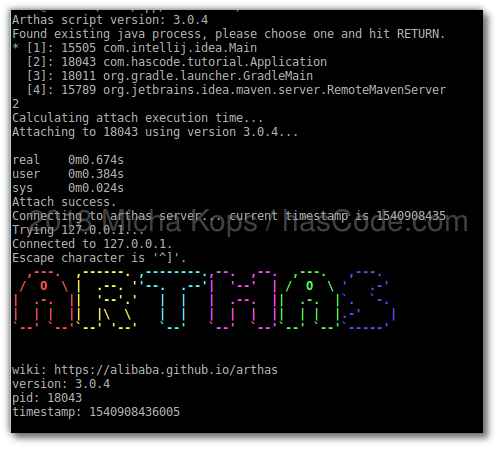 [--attach-only] : only attach the arthas agent to target jvm. [--use-version] : use the specified arthas version to attach. When typing in help, Arthas displays available commands. For more details on each command, simply type help command. keymap       Display all the available keymap for the specified connection. monitor      Monitor method execution statistics, e.g. total/success/failure count, average rt, fail rate, etc. trace        Trace the execution time of specified method invocation. 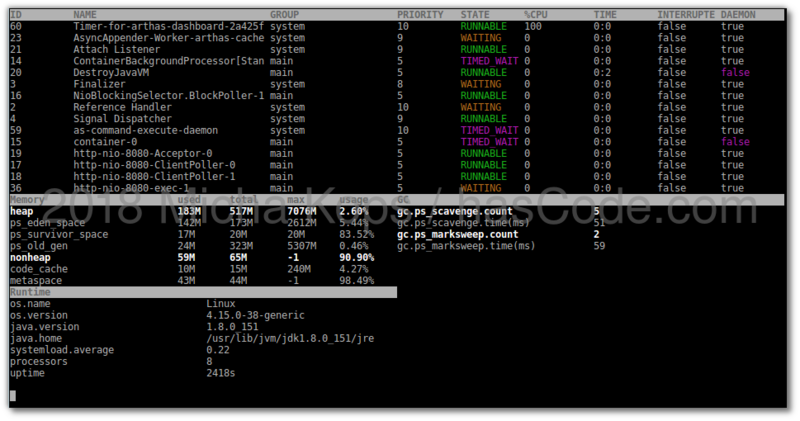 dashboard    Overview of target jvm's thread, memory, gc, vm, tomcat info. sysprop      Display, and change the system properties. Affect(row-cnt:6) cost in 8 ms.
Searching for all methods in the class com.hascode.tutorial.CurrentDateController. Affect(row-cnt:2) cost in 7 ms. Displays the classloaders used by our application. Affect(row-cnt:5) cost in 7 ms.
We’re decompiling the class com.hascode.tutorial.CurrentDateController. Affect(row-cnt:1) cost in 503 ms. In the following example we’re monitoring method execution statistics for the CurrentDateController’s formatCurrentDate method. Monitor method execution statistics, e.g. total/success/failure count, average rt, fail rate, etc. Affect(class-cnt:1 , method-cnt:1) cost in 33 ms.
Command execution times exceed limit: 10, so command will exit. You can set it with -n option. We’re displaying the stack trace for com.hascode.tutorial.CurrentDateController. Affect(class-cnt:1 , method-cnt:2) cost in 32 ms.
Affect(row-cnt:0) cost in 119 ms.
We’re tracing the exection time of the com.hascode.tutorial.CurrentDateController’s formatCurrentDate method. Affect(class-cnt:1 , method-cnt:1) cost in 35 ms.
We’re watching the first parameter com.hascode.tutorial.CurrentDateController’s formatCurrentDate method. Affect(class-cnt:1 , method-cnt:1) cost in 37 ms.
We’re capturing timings for com.hascode.tutorial.CurrentDateController’s formatCurrentDate method. Affect(class-cnt:1 , method-cnt:1) cost in 39 ms.
Affect(row-cnt:5) cost in 2 ms.
Affect(row-cnt:1) cost in 32 ms. Successfully changed the system property. This entry was posted on Wednesday, October 31st, 2018 at 9:25 pm	and is filed under Java. You can follow any responses to this entry through the RSS 2.0 feed. You can skip to the end and leave a response. Pinging is currently not allowed.